Microsoft Dynamics CRM 4.0 shipped with Data Migration Manager (referred as DMM from here on) to provide customers a solution to migrate data from their current solutions to Microsoft Dynamics CRM 4.0. DMM has made people happy with its unique set of functionality. But, when it came to advanced data migration mapping, customers wanted more support in dealing with XML based maps. That fortunately is not the end of story and just a beginning of a new one. 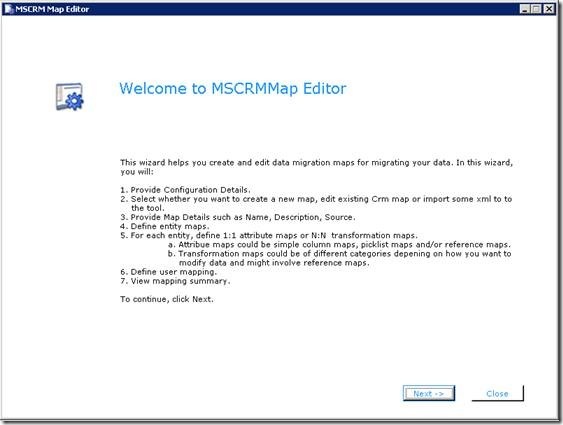 The good news is that the UI is created to fulfill customers’ requirements for a UI interface which could have made their life easier by allowing them to create complex transformation maps, pick list maps, is found in a tool called ‘Advanced Data Migration Map Editor for MSCRM 4.0 data migration’ (‘Map Editor’ in short) which helps people create, edit data migration maps without looking at XMLs. A user can create and/or edit entity maps, attribute maps, complex transformation maps, and pick list maps, reference maps, and user maps. 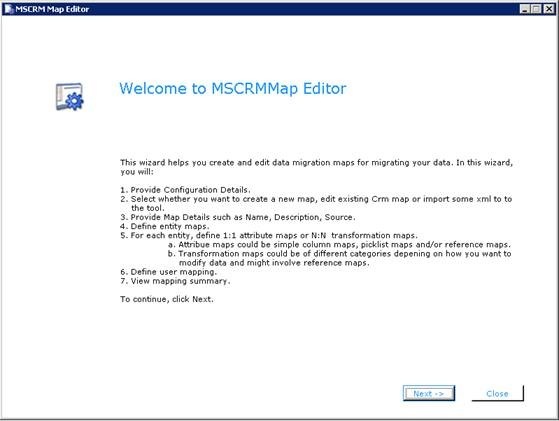 Not only can a user look at the summary of your map in the end, they can import it to a Microsoft Dynamics CRM 4.0 solution. Users who have to deal with deployment of CRM and Migration of data, administration and customization are the targeted users of the tool. The tool deals with CRM metadata and makes a call to CRM metadata service to retrieve it. To run this tool, user should have enough privileges to retrieve CRM metadata. System customizer role (Out of box) would solve the purpose. Though attempt is made to make UI very simple and intuitive, the problem the tool solves itself is of complex nature. To help user use the tool correctly, a User Guide for the tool is provided and it can be found by the name of ‘MSCRM DMM Map Editor – User Guide’ under ‘Releases’ tab at http://www.codeplex.com/mscrmmapeditor. The user guide attempts to provide complete picture of the tool with its usage, the screens and controls on each screen of the tool. 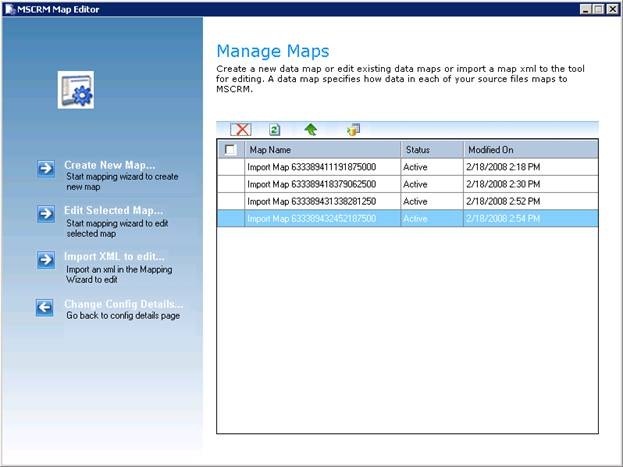 A bunch of demo topics can further help in specific actions while creating/editing data migration maps. Can you walk me through the tool? Yes, of course. The tool starts with a welcome screen, which summarizes for you, what you can do further in the tool. Clicking ‘Next’ takes you to screen with configuration details. You need to provide details related to CRM deployment and authentication. The basic choice you have to make is for ‘mode’. 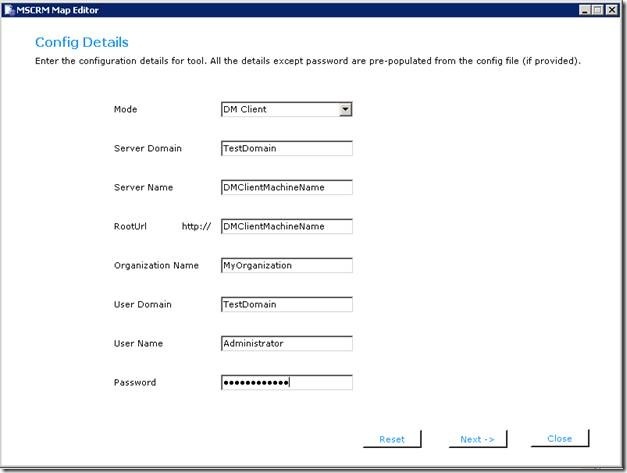 You can choose to connect to ‘DM client’ or Server, for metadata and existing CRM map details. For server mode you can run tool from anywhere but for ‘DM Client’ mode, you will need to run the tool on the same machine as DM client and also make sure that ‘Microsoft.Crm.Application.DMHoster.exe’ is running. (If the user has launched DMM then this exe will be running). If it is not running then please run it from folder “\Microsoft Dynamics CRM Data Migration Manager\DMClient\res\web\bin”. On clicking next on this screen, metadata and existing CRM maps are loaded. A pop-up will appear which will show you the progress for this operation. Once metadata is loaded, you can click on ‘OK’ button to advance to next screen. Export an existing CRM map to XML file. On choosing first 3 options, you will be taken to a series of screens which will help you define data migration map of your requirement. Please consult ‘User Guide’ for the tool as I said above, to walk you through all scenarios with examples. That is it; isn’t it simple? You did not have to edit any XML directly even in more complex cases. The tool does it for you. So I say, “Happy Mapping”. Your feedback and comments will be of great value for me, so please feel free to provide those.